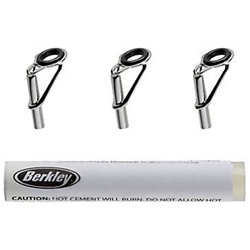 Berkley's Guide Tip Repair Kit includes one stick of quick dry cement and three 7/64" medium quality silver tips. Instructions: 1. Remove damaged tip by heating with an indirect flame just enough to remove damaged tip. (approximately 3-5 seconds) 2. Melt the end of the cement stick for about 3 seconds and immediately apply to the end of the rod blank. 3. Heat barrel end of new tip for 3-5 seconds and slide over cement rod blank. 4. Align new tip with rod guides immediately and hold in place for 5-10 seconds to allow cement to dry.